It's time for 'Sew Crafty Fridays' at Shereen's blog. Stop by to see what everyone is working on and add your craft project to Mr.Linky. This is a guest book I made for my aunt's 70th birthday. It was a little rushed as I only found out at suppertime last Friday that they didn't have one. The party was on Saturday, so I had to do it up pretty fast. This was our gift to her. I had a 6"x6" album on hand so used it for the book. I took pictures at her party too and, I will scrapbook the highlights to add to the album. I made pages to fit it by quartering a sheet of 12"x12" 'confetti cream' paper. 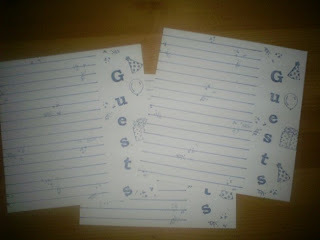 The album was blue so I used a navy pen to make lines for the names and, added the word 'Guests' and some party stamps. 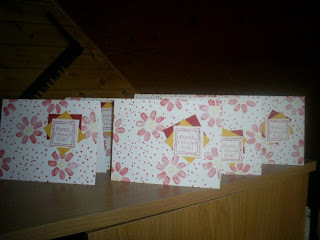 These are some 'Thank you' cards I made. I am really liking the red and yellow together. Posted by Lisa at 12:18 p.m.
Wow, it looks great. So you made up the lines on the paper? It really does look like it came like that. What a nice gift. 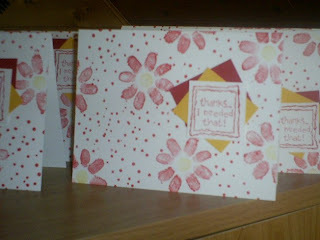 So did you stamp each and every little dot on the Thank You cards? I'm with you, the red and yellow go well together. I can't wait for you to share how you do a card. I saw some cardstock the other day and wondered if that was what you used to make your cards. Thanks for joining us today. March 30, 2007 at 2:47 p.m. 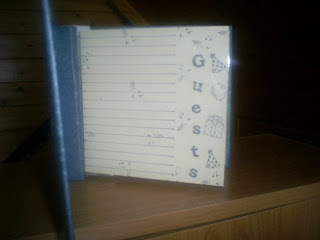 The guest book is so lovely! I am sure that your aunt really enjoyed it! HOw nice to make some pages to go with it! Those cards are absolultely adorable!! With all the creating you have been doing over there you are getting me in the mood for some paper crafts! March 30, 2007 at 3:28 p.m. They look great! I bet your aunt will treasure the book! March 30, 2007 at 4:28 p.m.
BTW, thanks for the nice comment over on my blog about the scrapbook page. March 30, 2007 at 4:32 p.m.